Welcome to the Fit Wife. This week has been a little stressful since it’s the final week of competition prep. People always ask me about competing, and I’m sure people have misconceptions as well. So I will share a bit of my prep with you. My mornings start between 5 and 5:30 am. If I need to send progress pictures, I don the ‘kini and clear heels at 5 am and set the camera timer. It’s not glamorous, I’m pale, tired-eyed and my hair looks like something a cat threw up. But progress pics need to be in by 8 am, so my coaches have to deal with all my morning glory. I get in some cardio. Typically I recommend weights then cardio. But some mornings I'm late, so I start with cardio, then if I have time, add whatever weights I can get in. Otherwise weights are done with a second cardio session. This lasts through the rest of the week, though Thursday/Friday workouts tend to be less tense only because you don’t want to go on stage super sore (you are in heels for a majority of Saturday) nor do you want your muscles to be too lean (there is a science to this). I don’t recommend two-a-day cardio sessions for the non-competitor. Not only is it time-consuming, for someone without a short-term goal, it’s hard to maintain. And “habits” hard to maintain don’t get maintained. So for all of you wanting a routine that is easier to stick with (hey, it's still called a WORK-out), I recommend high intensity interval training, both in cardio and weights three to four times a week, alternating days of cardio intervals with hour-long cardio sessions. 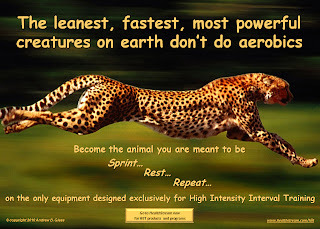 HIIT should only last 20 minutes at the most and involves bouts of high intensity (such as a sprint) with lower intensity (walking or jogging). This doesn't have to be done on a treadmill, try 30 seconds of vigorous peddling on a stationary bike or elliptical. 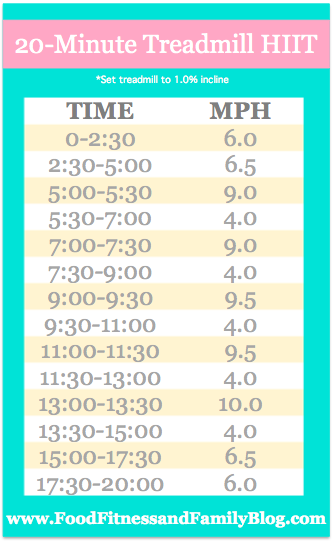 I usually recommend beginners start at 16 minutes, with 30 second sprints, and one minute of walking/jogging. Great plan; adjust speeds accordingly. And p.s. 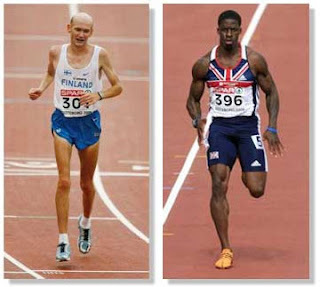 contestants on The Biggest Loser were asked to sprint at 10 mph for 30 seconds and could do it. Just try. Extra challenge, add 3-5 pound dumbbells to your recovery walk. 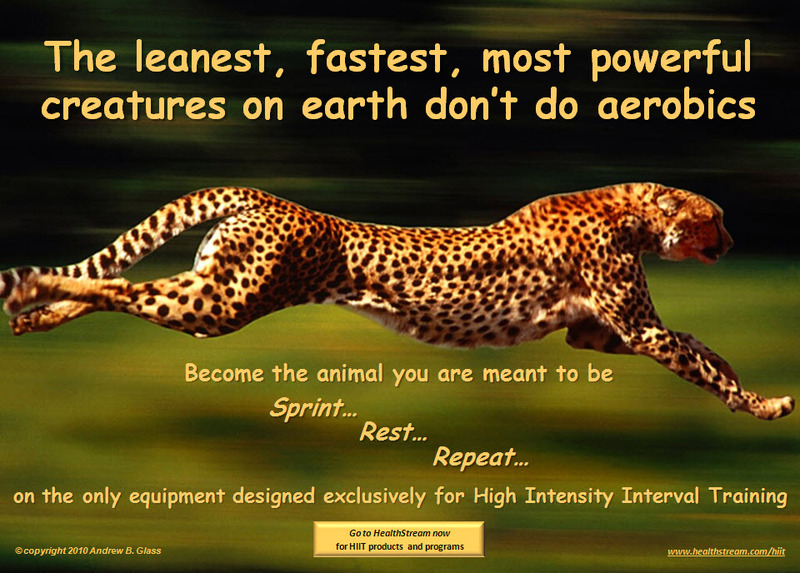 What I LOVE about HIIT (besides only taking 20 minutes) is that you can customize as you grow in speed and strengthen. Don’t be afraid to challenge yourself, but also don’t be afraid to lower the intensity if it seems to be too much. It should be difficult, you'll want to pass out/throw up/die, but you should be able to complete it. 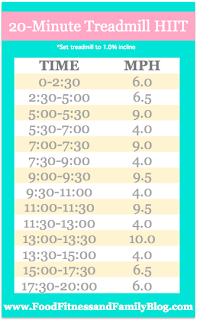 Even better than fitting into your schedule: a recent study showed volunteers who did intervals on a stationary bike, totaling 2.5 minutes of sprint action, burned on average an extra 200 calories a day! Not to mention HIIT help to maintain lean muscle. As far as HIIT, it involves grouping a set of exercises (I like to group 3 or 4 together) and do each as fast as possible, with the most challenging weight at a fast speed.